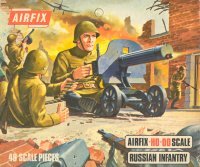 This set of Russian infantry was still quite early in the Airfix range, but it was not one of those retooled later. Airfix tended to follow a formula for the poses in their sets, and the poses here closely resemble those in the Japanese Infantry set. The two groups - the mortar and the machine gun - are the pick of the bunch, but the man lying on his side and pointing is a puzzler as we could not decide exactly what he is supposed to be doing. Perhaps he is meant to be wounded. The uniform is of the 'classic' Soviet infantryman, with the traditional gymnastiorka shirt-tunic (in the pre 1943 style) and the 1940 helmet. All the men also wear the plashch-palatka, the rolled greatcoat, across their body. Detail is not particularly clear, but the uniform looks to be well done and appropriate. This lack of clarity also makes the weapons difficult to identify. Most men carry rifles, but a couple do have machine guns. The mortar looks like a 120mm calibre, and the heavy machine gun is probably a representation of the Goryunov 7.62, which replaced the Maxim in 1943, although this undetailed model could almost as easily be the Maxim itself. The age of these figures means they are not up to today's standards, with vague detail and quite stiff animation. There is a certain amount of extra plastic and flash to be removed, and the two group pieces do not fit securely into the holes on their bases. Still they are fairly serviceable, if a good deal poorer than the range of competition available today, and just barely justify their recent reissue.